Between April and September of 1980, as Sagan’s Cosmos was making its debut and exactly half a century after Einstein’s famous dialogue with the Indian philosopher Tagore, trailblazing physicist David Bohm and Indian spiritual philosopher Jiddu Krishnamurti sat down for a mind-bending, soul-stretching series of conversations about some of the most abiding human concerns: time, transcendence, compassion, death, the nature of reality, and the meaning of existence. They were at once an unlikely pair and perfect counterparts: After completing his Ph.D. in physics at Berkeley under Robert Oppenheimer, Bohm went on to teach at Princeton, where he collaborated closely with Einstein; he spent the vast majority of his career tussling with the nature of reality and his unorthodox ideas revolutionized quantum theory. At the age of thirteen, Krishnamurti was declared a vehicle for the “World Teacher” — a high spiritual entity — by the Theosophical Society; he firmly renounced the role at thirty-four and went on to become one of the most influential Eastern thinkers of the twentieth century, practicing and teaching meditation as a way of life from a deeply philosophical and psychologically astute perspective dedicated to advancing our understanding of the nature of the mind. 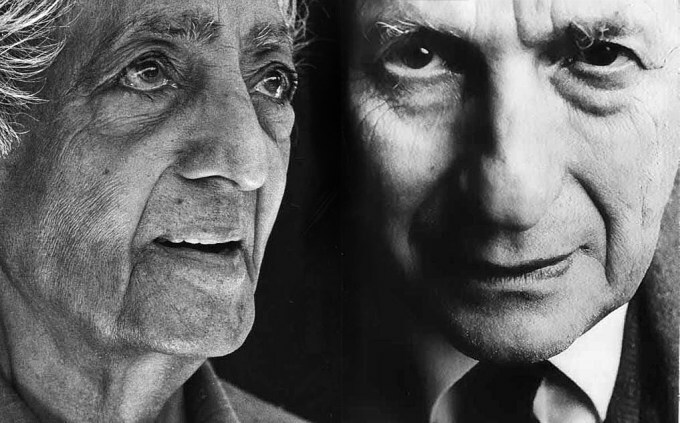 By the time the two met, Krishnamurti was eighty-five and Bohm sixty-three. Their dialogues, eventually published as The Ending of Time: Where Philosophy and Physics Meet (public library), are among the most intensely intelligent and illuminating packets of human thought ever produced. JK: Thought is the movement between the particular and the general, and thought is also born out of the image of what has been accumulated. All that is one’s inward state. That is deeply embedded in me. I recognize it is somewhat necessary physically. But how do I set about realizing that psychologically it is not? How do I, who have had the habit of accumulating for millennia, general and particular, not only recognize the habit, but when I do recognize the habit, how does that movement come to an end? That is the real question. Where does intelligence play a part in all this? DB: There has to be intelligence to see this. JK: Is it intelligence? Is it so-called ordinary intelligence or some other intelligence, something entirely different? JK: Is that intelligence related to love? DB: I’d say they go together. JK: I’m asking further if this intelligence is associated with or related to or part of love. One cannot accumulate love. DB: No, people might try. People do try to guarantee love. JK: It sounds silly! That is all romantic nonsense, cinema stuff. You cannot accumulate love. You cannot associate it with hate. That love is something entirely different. And has that love intelligence? Which then operates? Which then breaks down the wall? 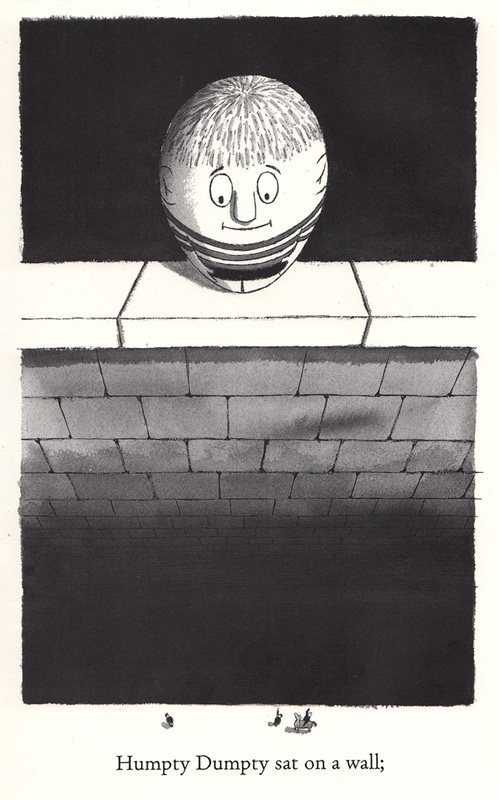 Illustration by Charles Addams from his vintage take on Mother Goose. Click image for more. JK: I don’t know what that love is. I know all the physical bit. I realize pleasure, desire, accumulation, remembrance, images, are not love. I realized all that long ago. But I’ve come to the point where this wall is so enormous that I can’t even jump over it. So I’m now fishing around to see if there is a different movement which is not a man-made movement. And that movement may be love. I’m sorry to use that word because it has been so spoilt and misused, but we’ll use it for the time being. So is that love, with its intelligence, the factor that will break down or dissolve or break up this wall? Not “I love you” or “you love me.” It’s not personal or particular. It’s not general or particular. It is something beyond. I think when one loves with that intelligence, it covers the whole; it’s not the particular or general. It is that. It is light; it’s not particular light. DB: The wall itself is the product of the process which is illusion. JK: Exactly. I’m realizing that the wall isthis movement. So when this movement ends, that quality of intelligence, love and so on, is there. That’s the whole point. Perception is part of love, isn’t it? So the very perception, without any motive, without any direction, of the wall — which has been brought into being by this movement of accumulation — isintelligence and love. 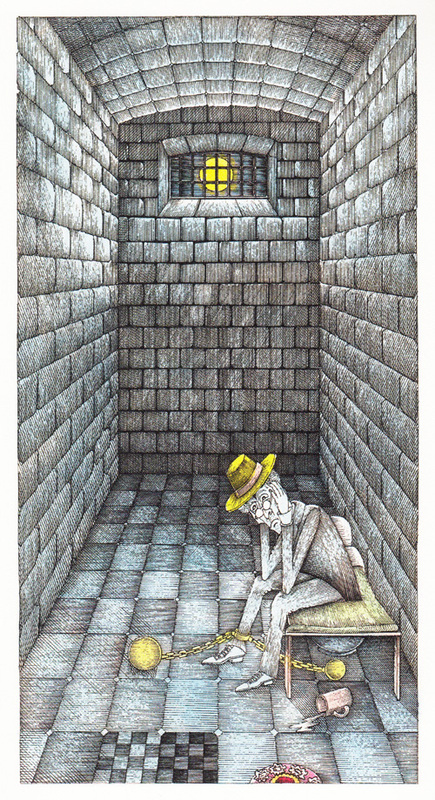 Art by John Vernon Lord from a special edition of Lewis Carroll’s ‘Through the Looking Glass and What Alice Found There.’ Click image for more. JK: What makes the mind always follow a certain pattern? Always seeking? If it lets go of one pattern, it picks up another; it keeps on functioning all the time like that. One can give explanations why it does so — for protection, for safety, from slackness, indifference, a certain amount of callousness, a total disregard of one’s own flowering, etc. It is really very important to find out why our minds are always operating in a certain direction. We have said that one comes, after going through travail, investigation, and insight, to a blank wall. And that blank wall can only wither away or be broken down, when there is love and intelligence. But before we go into that, I would like to ask why human beings, however intelligent, however learned, however philosophical and religious, always fall into this groove. DB: Well, I think the groove is inherent in the nature of the accumulated knowledge. It seems to me that the groove, or the accumulated knowledge, has a significance far beyond what its significance is. If we say that we have knowledge of some object, like the microphone, that has some limited significance. But knowledge about the nation to which you belong seems to have immense significance… Because this knowledge seems to have a tremendous value beyond all other values, it makes the mind stick to that. It seems the most important thing in the world. JK: Stupefies, all right. But the brain doesn’t seem to extricate itself. DB: It is already so stupefied that it can’t see what it is doing. JK: So what shall it do? I have been watching for many years people attempting to become free from certain things. This is the root of it. You understand? This psychological accumulation which becomes psychological knowledge. And so it divides, and all kinds of things happen around it and within it. And yet the mind refuses to let go. DB: The knowledge deceives the mind, so that the person is not normally aware that it is destructive. Once this process gets started, the mind is not in a state where it is able to look at it because it is avoiding the question. There is a tremendous defensive mechanism to escape from looking at the whole issue… Because it seems that something extremely precious might be at stake… Once importance has been given to knowledge, there is a mechanical process that resists intelligence. 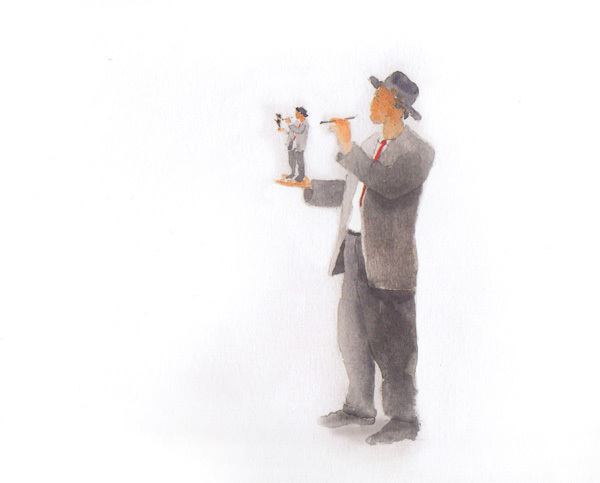 Art from ‘The Well of Being’ by Jean-Pierre Weill. Click image for more. DB: This knowledge creates the “me,” and the “me” is experienced as an entity which seems not to be knowledge but some real being. JK: Are you saying that this “being” is different from knowledge? DB: It isn’t, but the illusion has great power. The question is how do we get through that to break down the groove, because it creates the imitation, or a pretension, of a state of being? How to get out of that groove is what Bohm and Krishnamurti explore in the remainder of the wholly revelatory The Ending of Time. Complement it with Alan Watts on the ego and the universe, Alan Lightman on science and spirituality, and biologist turned Buddhist monk Matthieu Ricard in conversation with his father, the great French philosopher Jean-François Revel, about the nature of the self.